Fast, futureproof and flexible; the next generation of control panel is here and it’s better than ever! 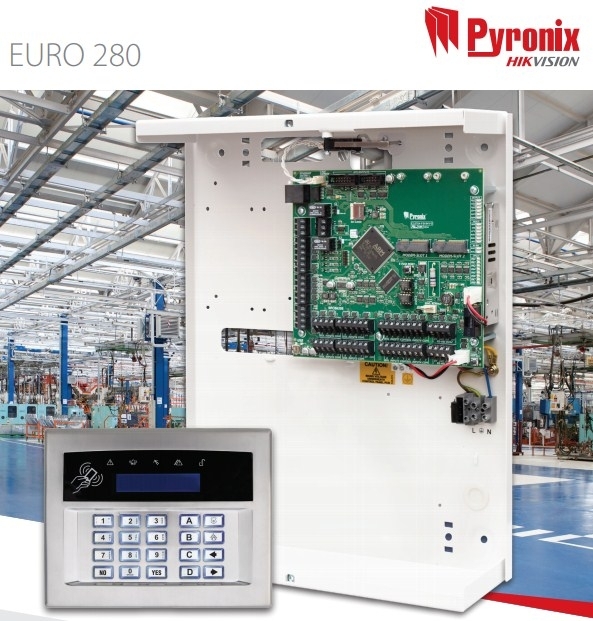 Providing maximum choice and flexibility to deliver the ultimate security solution, the all new EURO 280 is the premium panel for any Grade 3 installation. Much more powerful than ever before, the new processor delivers much faster and more accurate data messages between the control panel and its connected devices. Enables devices to be added in two separate areas to deliver greater security, convenience and contingency. Provide local indication for detector input status, & to show whether each input is Closed, in Alarm, in Fault or in Mask. There are two LED’s to show the status of the RS485 buses, six LED’s for the status of all fuses and six LED’s to show the status of the programmable outputs. Much smaller and more energy efficient than before, this power supply is positioned more conveniently within the control panel to allow room for additional equipment to be imported inside. Protect the control panel from any surges of current, with the ability to be engineer reset into a ready state again, rather than having to be manually replaced like glass fuses.